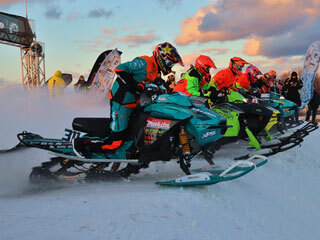 Le Grand Prix Ski-doo de Valcourt is the most important winter motorized sport event in the world. Our organization works hard to give you a exciting and unique show. Since 1983, the GPSV is the only event to present all types of races including snowmobile, motocross and ATV on ice oval, ATV and motocross on ice road circuit, snocross (snowmobile on cross track), snowmobile drag. Facing the best racers in the world, over the course of a weekend at the legendary circuit Yvon-Duhamel. Valcourt, the world capital of snowmobile, and its people are always proud to accommodate nearly fans, spectators and snowmobilers.